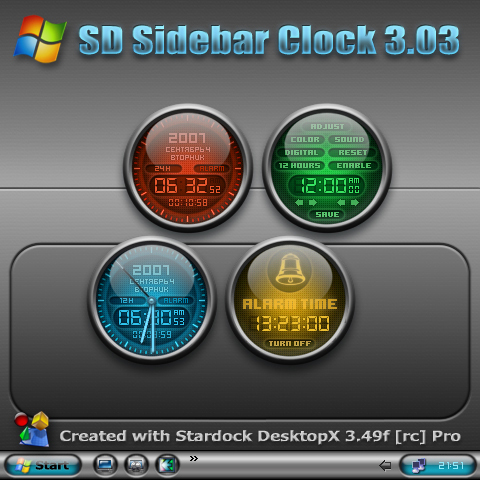 Sidebar Alarm Clock (based on the script from SD Clock 3.02). 2. Click on the Clock to turn on the "Settings" display. 3. Add the necessary adjustments. 4. Click on the Clock again to return back. * Seems I have done enough clocks now... Newer more! Now I may to create some base object like Vista sidebar with a several small widgets integrated in it. Then I just save each of them as Vista gadgets and they will work in a real sidebar. P.S. I think that I must delete the previous clock from gallery. It's no need here. Beatiful work! Vad, is there a way that this gadget can be used on XP system? 1. Open the file "SD_SidebarClock.gadget" in the WinRar (or any other archivers that can read this file). 2. Extract the file "SD_SidebarClock.exe" from the DesktopX directory in the archive. 3. Double click on the extracted file to run it. Thank you Vad. Look forward to your new toys. This your work is beautiful. I not install in windows vista, return the error, this widget isn't windows vista gadget. How do I do for install it in windows vista? It seems to me that you need to have the DesktopX installed to run it because this gadget is not a standalone. If this will not help you I have no more ideas because don't use Vista. The perfect size for the sidebar! One small thing i noticed...it sits a bit left of center on the sidebar. Most gadgets on the sidebar sit about one eighth of an inch from the left border on the sidebar...your is on the left border, so it's a little off center. Not a big deal, probably a small margin adjustment. But it looks and works beautiful as all of your work does. I extract with winrar and folder en-US I changed to es-ES and work in Spanish language. I have unloaded many gadgets of the official page Windows Vista Sidebar and they were not loading until it was changing the folder en-US into es-ES. 1. DesktopX client is showing up in the system tray as running. I even loaded a DX gadget to make sure. 2. I opened the archive and clicked on the gadget to install. It does, but shows up on my sidebar saying "DesktopX must be installed to use this gadget." Any help to get this up and running would be appreciated! Thanks Vad_M! And you're right my copy of DX came via SDC. Looking forward to the new version! how to change the color? the only color available is blue? btw great work... thx!! !